As one of the lone Yanks in my Southern American Lit class at W&L (taught, of course, by a Mormon professor from Utah), I was shocked to hear that almost all my male Deep Southern classmates shared a common experience: their first hunt. I always expected a few hun'in' stories -- it was the Last of the Mohicans-type details that got my attention. Around age 13, their daddies took them out, shot a deer and then rubbed their faces in blood to symbolize their transformation towards manhood. Think of it as the Southern Protestant answer to the Bar Mitzvah. I wonder if these European folks performed similar rituals on their first trips into the woods. 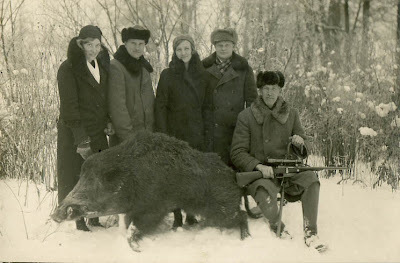 The top photo, shot in the '20s, shows a very big boar shot with a very modern, sinister looking assassin’s rifle. 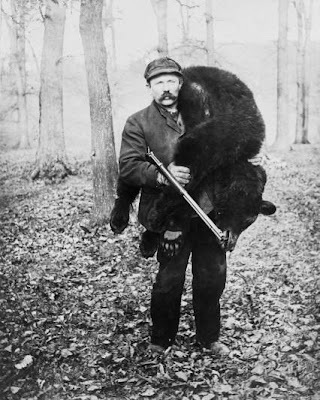 The man with the bear went on his hunt in 1909. Great site. Keep up th egood work.